Generally in stock. Please allow for transit time. 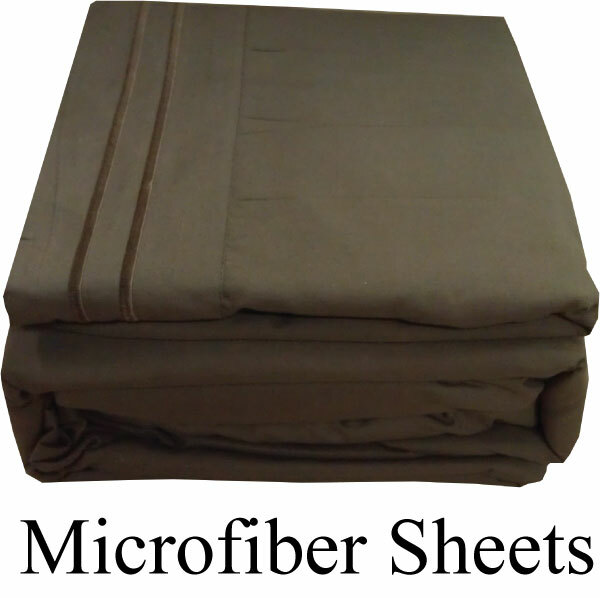 Microfiber Sheets, King Size. These high thread count sheets feel like you paid a fortune for them. They are silk like to the touch. They are a brushed microfiber that will actually soften each time washed! Cleaning Instructions: Please do NOT bleach, iron or dry clean. Machine wash in cool water and non-harsh detergent. Tumble dry low and remove from the dryer promptly. Set includes one flat sheet, one fitted sheet and two pillowcases. Thread Count is 1500, wow! Deep pocket fitted sheet will fit up to a fifteen inch thick mattress. Flat Sheet approximately 102" x 105"
Fitted Sheet approximately 78" x 80"
2 King Pillowcases 20" x 40"
Packed in plastic suitable for gift giving! Microfiber bedskirt matches the sheets. Give your bed that finished look! Fits up to a 15" thick mattress! 2 Shams Included 36" x 20"
King Duvet Cover is 104" x 90".